During his first year as head of the Department of Energy, Secretary Rick Perry has been almost singularly focused on one thing: realizing President Donald Trump’s empty promise to revitalize coal as a power source in the United States. Perry’s crusade for coal began in April, when he ordered the DOE to conduct a study on grid reliability — namely, whether renewable energy was accelerating the retirement of coal-fired power plants and threatening the reliability of the U.S. energy grid. The study, which was finally released in August, did not find that renewable energy was having that effect, instead pointing to low cost and abundant natural gas as the primary factor in coal’s decline. Nonetheless, in September, Perry followed up the grid study with a proposed federal rule that would effectively subsidize power plants that keep at least a 90-day supply of fuel on site — namely, coal and nuclear plants. In defending the rule before Congress, Perry used the example of a series of blackouts that occurred in Texas while he was governor. “One of the things as an elected official I never wanted to have to explain to anybody is why we didn’t have the vision to put into place… a resilient power system,” Perry said. But Perry isn’t really concerned with putting in place a resilient power system for all Americans — just look at Puerto Rico and the U.S. Virgin Islands for proof. Four months after Hurricane Maria tore through the Caribbean and devastated the power grid in both Puerto Rico and the U.S. Virgin Islands, thousands of U.S. citizens remain without electricity. The Army Corps of Engineers just announced that Puerto Rico likely won’t see its power fully restored until May — a full eight months after the disaster first hit. The islands are currently suffering through the longest blackout in American history, which has forced hospitals to go without power and sparked a public health crisis. “If Rick Perry was serious about grid reliability, he would have had the Department of Energy be more effective in Puerto Rico and the U.S. Virgin Islands, where the majority of residents still do not have electricity since the hurricanes,” Judith Enck, former regional administrator for EPA Region 2, which includes Puerto Rico and the U.S. Virgin Islands, told ThinkProgress. The ongoing crisis in Puerto Rico undermines Perry’s claims that the retirement of coal-fired power plants are the primary crisis threatening grid reliability throughout the country. On the contrary, most problems with the grid are weather related — a storm knocking down power lines, a storm surge flooding coastal power infrastructure, or a tree falling on important equipment. Even Perry’s example of the blackouts in Texas was weather related: an investigation by the Dallas Morning News found that the blackouts were caused, at least in part, by coal plants automatically shutting down when the cold weather interfered with the plants’ motioning systems. Looking forward, climate change will only exacerbate the grid’s vulnerability to extreme weather events. The storm surge from Hurricane Sandy, which scientists say was made worse by climate change, flooded power generating stations and left some 8.2 million customers along the East Coast without power. According to a 2014 report from the Union of Concerned Scientists, there are several ways to make the U.S. grid more reliable. One way is to simply protect power equipment from weather-related damages, like cutting trees around power lines to ensure wind gusts won’t knock entire lines out. Another way is to employ smart grid technology, which can more seamlessly pull power from other sources in the event of an outage. Bringing more renewable energy online also helps with grid reliability, because wind and solar aren’t reliant on fuel sources that could be cut off, or flooded, in the event of a disaster. The American energy grid is a sprawling, decentralized, and aging system, meaning these upgrades are both necessary and extremely difficult to implement effectively. But Puerto Rico and the U.S. Virgin Islands’ energy plight offers a silver lining — a chance to actually rebuild a grid with an eye towards the kind of resiliency that Perry and others in the Trump administration speak of so highly. Instead, the administration is doing the complete opposite, offering an ad hoc list of solutions that basically amount to rebuilding the islands’ grids to the same standard as before the storm. Rebuilding in Puerto Rico has been characterized by controversy, with the government-owned Puerto Rico Electric Power Authority (PREPA) initially offering a $300-million, no-bid contract to Whitefish Energy, a tiny Montana company coincidentally from Interior Secretary Ryan Zinke’s hometown, to rebuild much of its grid infrastructure. 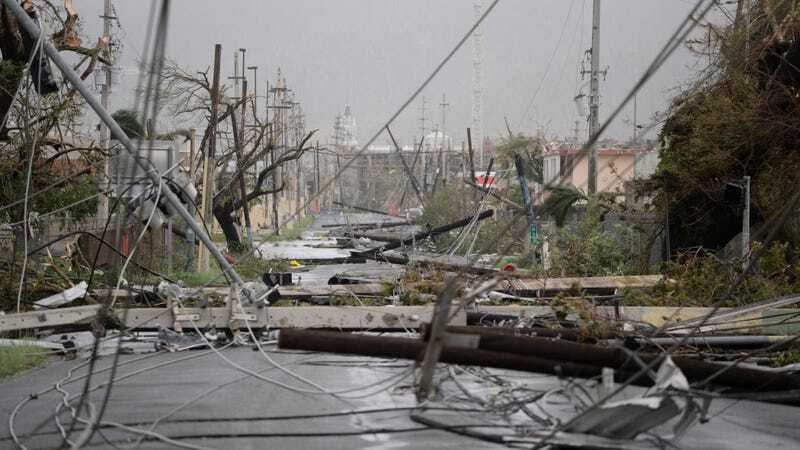 Following public scrutiny of the deal, Puerto Rico cancelled its contract with Whitefish, and handed control of disaster-relief spending to the Federal Emergency Management Agency (FEMA). If Perry were truly interested in creating a reliable grid for all Americans, he would take the opportunity in Puerto Rico and the U.S. Virgin Islands to deploy cutting-edge technology, like microgrids, to create a more resilient system, instead of the centralized power system Puerto Rico depended on before the storm. Building those microgrids around renewable energy and battery storage would help drive down energy costs for the islands, which suffer from high electricity prices due to having to import fuel. And solar power would allow the islands to be more resilient if, and when, they are hit with another storm, because solar power combined with battery storage can run without needing an entire grid to power it. Tesla has already done this for one hospital in Puerto Rico, restoring power with solar panels and battery storage. But Perry isn’t really interested in grid reliability. Instead, he’s using what sounds like an attractive idea for all Americans to push for a rule that would benefit a lucky few — chiefly, the coal executives to whom President Trump has pledged his endless support.